When you think of New Orleans, stationery might not be the first thing you think of. I'll admit, it wasn't even for me. But when I found out I would get to spend a weekend in New Orleans this spring, you can bet I looked into it. As any healthy pen addict would. Turns out, it's a fantastic place to indulge in stationery tourism. So I did. The first place I went (and I don't just mean the first stationery store--I mean literally the first building I entered upon arrival in New Orleans) was Papier Plume in the French Quarter. It is located at 842 Royal St, conveniently near a million fun things, so you can't miss it. Patrick and Renso run the show there. You may have seen them at a pen show, but nothing beats seeing them in their beautiful shop in New Orleans. The store is gorgeous, beautifully furnished with art and antique furniture, with big windows that let in tons of light and a view of the iconic ironwork galleries across the street. And then there are the tempting wares--shelves and tables full of beautiful papers, glass dip pens, handbound leather journals, desk accessories, seals, Italian leather bags, and of course pens. Many in styles and brands from Europe that I had never seen in person before. Of course I caved. Happily. I purchased a Jean-Pierre Lepine Indigo Classic in Cocobolo wood. I was charmed by its wee pocket size and lovely woodgrain. And I paired it with a handcrafted leather and marbled paper journal. The perfect souvenir match. The only reason I didn't buy any ink is because 1) we were traveling without checked bags and I feared for a delicate bottle in my backpack, and 2) I honestly couldn't decide on any one among the incredible selection. I'll be placing an online order soon, I'm sure. Patrick and Renso were as warm and welcoming as their lovely shop and I can't recommend them highly enough. You can, of course, shop online--but I suggest a trip to New Orleans, instead. Also, a little bird told me that they'll be making an appearance at the Atlanta and Chicago pen shows. Later that weekend, I ventured out to Scriptura at 5423 Magazine St. This shop is located in the Garden District of New Orleans, possibly one of the most walkable neighborhoods on earth if you love browsing beautiful architecture. And when you're done picking out all of your future dream homes, you can pop into this wonderfully appointed shop to purchase your housewarming invitations. This shop, which retains a rich historical character inside in keeping with its surroundings, caters mostly to paper and letter writing. Their selection of cards and papers is infinitely browsable and endlessly tempting. They also have a case of rollerball and fountain pens, including some nice pieces by Pilot, Retro 51, and Lamy. There are also shelves with a nice ink selection. I picked out a lovely postcard, a notecard, a 2-pack of Cavallini & Co pocket notebooks with bugs on them, and a midi-size Paperblanks Flexis with 240 pages, a ribbon bookmark, and beautiful marbled edges. I hadn't encountered the softcover Paperblanks before. I think I'm in love. I didn't get to chat much with the proprietors, but they showed me some of the past Retro 51 New Orleans special editions. It's probably best for my wallet that I couldn't buy them anymore, but you can bet I added my name to the list to find out about the next edition. They were also kind enough to let me use their outlet to charge my phone so I could continue taking pictures. As much as I devote my life to analog tools, my sketches would not have done the place justice. You really must see it for yourself, and I very much recommend that you do. I did a lot of wonderful things in New Orleans. The city completely captured my heart. I know I'll go back someday, and when I do, I look forward to visiting my new pen friends there and shopping for souvenirs. Posted on April 4, 2019 by Sarah Read and filed under Papier Plume, Scriptura, Travel. House of The Rising Sun is the latest ink release from Papier Plume, stalwarts of the New Orleans pen scene. This shade is as hot as fire itself, and will look great in any of your fountain pens. I have one bottle to give away, courtesy of Papier Plume, so read the rules below and enter away! Posted on April 17, 2018 by Brad Dowdy and filed under Giveaways, Papier Plume. A few weeks ago I reviewed Kaweco Smokey Grey ink. Unfortunately, I was unimpressed with that ink, but I needed a matchy ink to go with my lovely Montblance Alexandre Dumas fountain pen. So, I bought some grey ink samples from Vanness Pens and decided to compare them. The six inks I compared are Kaweco Smokey Grey, Robert Oster Graphite, Kobe #10 Mikage Grey, Papier Plume Oyster Grey, Akkerman #29 Hofvijver Grijs, and Kobe #46 Nagisa Museum Grey. In the comparison above, you can see that I wound up with quite a variety of greys, ranging from the very light Kaweco to the almost black Nagisa Museum Grey. 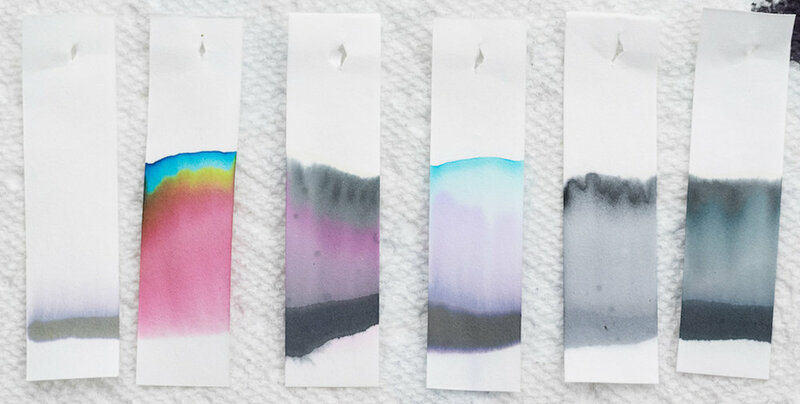 The chromatography on each ink reveals some interesting characteristics. Kaweco Smokey Grey has virtually no color range, varying slightly from grey to light lavender. Robert Oster Graphite is the most spectacular of the bunch at least in terms of chromatography, with lots of magenta and blue. Kobe Mikage contains mostly lavender and a little bit of blue. Papier Plume Oyster Grey contains blue and magenta tones. Akkerman Grijs is, perhaps, the truest grey, revealing no other colors. Kobe Nagisa Museum Grey is the darkest of all, and like the Akkerman, it demonstrates virtually no color variation. 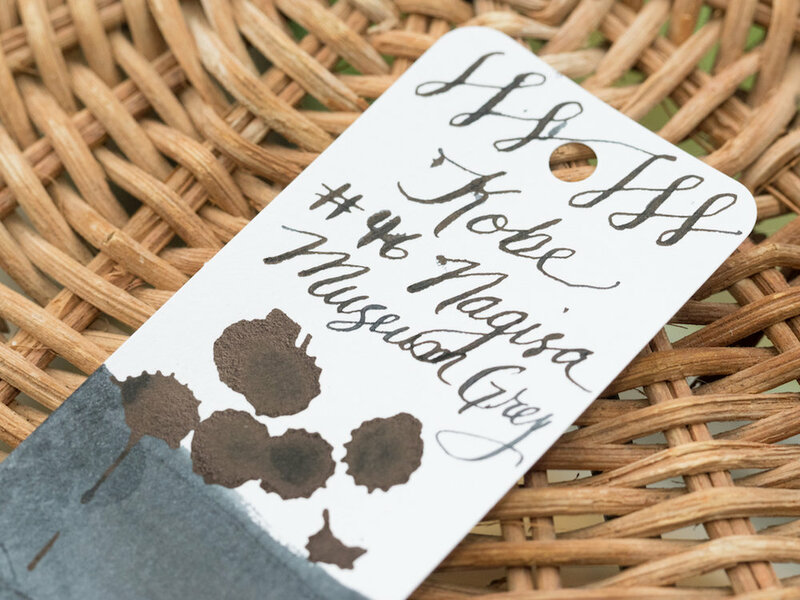 Close ups of the ink swatches show what each ink looks like using a Brause 361 Steno Blue Pumpkin Calligraphy Pen Nib along with splotches and swabs. Kaweco Smokey Grey is quite light in the swab, but with the wet dip nib, it writes more like a dark grey. 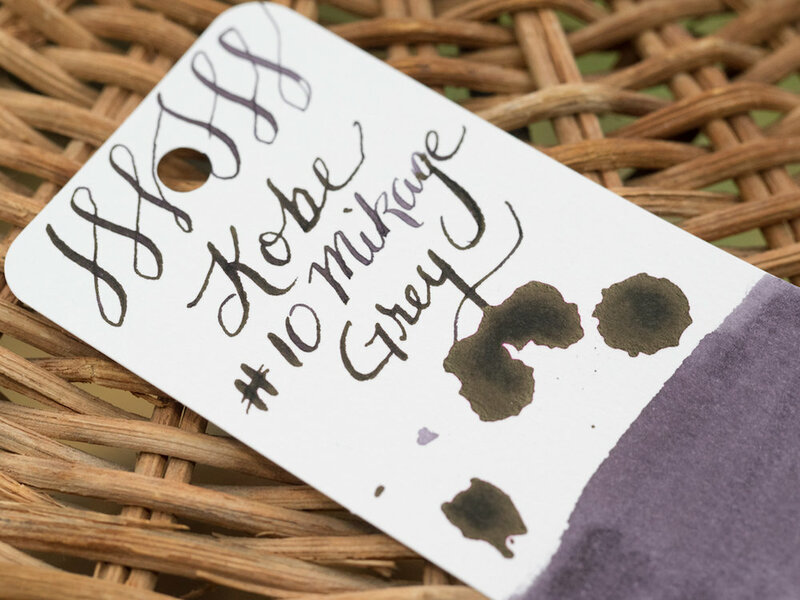 Robert Oster Graphite, despite its colorful chromatography, is a dark grey both in the swab and with the pen. The ink splats show a tiny bit of sheen, but unfortunately it’s been raining in Abilene all week, and I couldn’t get pictures with sunlight displaying the sheen in all its glory. Kobe Mikage Grey, in my opinion, is the most intriguing shade of grey. In the swab, the writing, and the splats its purple hue is quite striking. Papier Plume is a really nice blue-grey as revealed in the swab. With the pen, it appears as a dark grey with some blue sheen. Akkerman Grijs is definitely the truest grey. The swab shows that it’s a flat color with little variation. Kobe Nagisa Museum Grey is very close to black with some nice sheen. I was really pleased with the wide variety of grey shades in these samples. I’ve pretty much written off Kaweco Smokey Grey as being too light and uninteresting for my use. If I wanted a true grey, I would choose the Akkerman. I found Kobe Nagisa to be too close to Iroshizuku Take-Sumi which I already own. Although Robert Oster inks are usually among my top picks, I didn’t much like Graphite, even though the chromatography made the ink look really interesting. So, of the six shades of grey, my two favorites are Papier Plume Oyster with its beautiful blue-grey tones and nice shading and Kobe #10 Mikage Grey with its deep purple-grey hue. It also shades quite well and has some sheen. Currently my Montblanc Alexandre Dumas is inked with Kobe Mikage. When I run out of that, I’ll put the Papier Plume in the pen and make my final decision about which ink I’ll buy. You can purchase a 30ml bottle of Kaweco Smokey Grey from JetPens for $13.50. All the other inks are available from Vanness Pens. Robert Oster Graphite is $17.00 for 50ml. Kobe #10 Mikage Grey and Kobe #46 Nagisa Museum Grey are $30.00 for 50ml. Papier Plume Oyster Grey is $7.00 for 30ml. And Akkerman Hofjijver Grijs is $28.00 for 60ml. Enjoy reading The Pen Addict? Then consider becoming a member to receive additional weekly content, giveaways, and discounts in The Pen Addict shop. Plus, you support me and the site directly, which I am very grateful. Posted on September 29, 2017 by Susan Pigott and filed under Ink Reviews, Akkerman, Kaweco, Kobe, Papier Plume.